Please check out the post of Ads Minded normal version for more information like the introduction and features of the Ads Minded. 2. 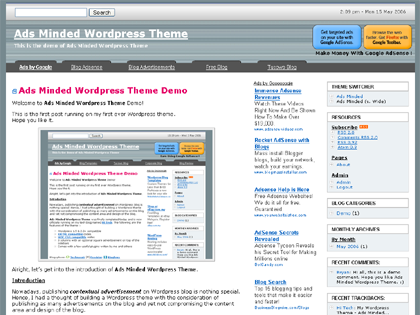 Place adsmindedwide folder into /wp-content/themes folder. 3. Login to WP admin control panel and enable Ads Minded (v. Wide) theme under Presentation. Any project before the end of the year to have the wide version widget compatible?? I just downloaded this theme and there’s no stylesheet in it, obviously the main file needed. Nevermind, I didn’t notice it was a folder within a folder, guess I ftp’d too quickly lol. could you release a version of the wide one with the post area on the right and the sidebars on the left please, I asked a while back but saw you havent got around to it.. more eyeballs look on the left than on the right for advertising. Thanks so much for your quick response, Bryan. I really appreciate your taking the time. Unfortunately, it doesn’t seem to explain why the front page (which has several posts including my keywords) gets a PSA and the individual posts all show up with a full complement of targeted ads. Even worse, since my blog is relatively new, I get the most hits on my front page. :( Oh, well, who can figure out the mysteries of Google? This theme will work with wordpress 3.8?? ?